Click here to view the 2018 Saint Patrick's Day Parade photos! assembly time this year: 11 a.m. near 50 West 44 th St., between Fifth and Sixth Ave.
is very important: no sneakers, jeans, or inappropriate dress or head attire. Chairman, and John Mulholland, the County Chief Executive, together with their wives. by the British occupying army. City. Congratulations to Shane and Tsedeye, who are expecting their first baby in July. who are expecting their first child in August. such as St. Patrick’s Day. notifications. Please see our contacts on page 1. 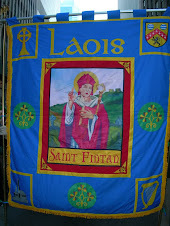  Laois Blog: www.nylaoisassociation.com for previous year’s photo gallery, etc.  NYC St. Patrick’s Day Parade website: www.nycstpatricksparade.org.